The full Moon in June is called the Strawberry Moon as in the Northern Hemisphere this is when strawberries are ripe and ready to pick. 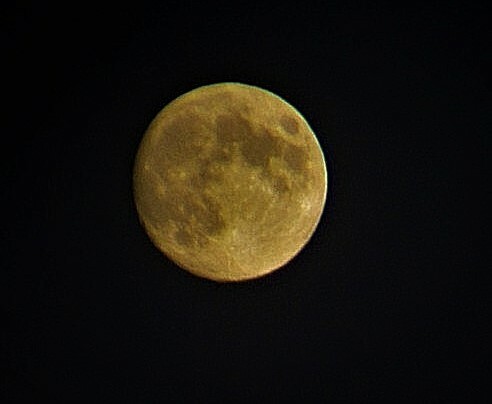 There was a nice clear evening on the 27th and the Moon was clearly visible. But like Robert the Bruce I tried and tried again. The end results were quite good and show craters and many lunar features. Apart from the embroidery on Desdemona's handkerchief real strawberries appear only once in Shakespeare's plays. In Richard III the Bishop of Ely is sent away from the Tower in Act III, Scene 4 on a fool's errand to get some strawberries from his palace garden in Holborn. With the Bishop out of the way Richard is able to conspire with Buckingham to get rid of Hastings who will likely object to his coronation. Richard is a real pantomime villain as he always tells the audience what he is going to do before he does it. However, possibly the real villain here is the Bishop of Ely one John Morton. Leaving aside the fact that John Morton was only seven years old when Richard III died at Bosworth and so was a little young to have achieved high office he is remembered for his medieval means test which became known as Morton's Fork. In order to judge whether someone was able to pay taxes to the crown and the church Morton had a simple test. If the person under scrutiny lead a lavish lifestyle and ate fine food then he was rich enough to pay. However, if the person was found to lead a frugal lifestyle then Morton assumed that they had simply squirrelled away a fortune in hidden savings so they still had to pay. Either way the person under investigation, whether rich or poor, had no choice but to pay up to support the lavish lifestyles of the Bishops and senior church clergy.